Ten weeks in Australia – who’s a lucky girl then? Yes, it’s not many people who are lucky enough to be able to take a ten week trip. And I’m also blessed by having a lovely circle of very hospitable family and friends in Australia, courtesy of my husband, who lived, worked and raised his family there. I managed to keep working just enough while I was away – I’m lucky again to work from home using the internet – but it’s hard to work as much as you want while not wanting to miss out on time with family and friends. In a nutshell, it started with a beautiful family wedding in Thailand; moved on to a couple of days in Brisbane Central Business District and then to two weeks staying with daughter, son-in-law and three grand daughters in Fernvale, Queensland; incorporating a few days with friends in Brisbane and a trip up to the Sunshine coast hinterland and Maleny; then to friends in Melbourne and the Mornington Peninsula in Victoria; a few days with friends in Sydney and then near Tumbulgum with views across country to Mount Warning; more days in Brisbane and a family holiday on the coast at Noosa. Obviously getting to know the grand-children, and spending time with them in their normal lives. Skype is great, but time together is greater! Seeing bits of Australia we haven’t seen before – the beautiful hinterland of the Gold Coast and the Sunshine coast and inland from Melbourne. Mount Tambourine, the Glass House Mountains and the Dandenong range. Visiting the site of the Australian gold rush in Ballarat. Enjoying the wildlife – the parrots and cockatoos seen daily; waking up to the unmistakable sound of kookaburras and Australian magpies; seeing wild hawks, eagles, wallabies and kangaroos. Eating the food – lovely meals in so many places. Big shout out for the Three Little Pigs Bar and Bistro near Mount Tambourine though! Lovely wine and beer tastings – please take a bow Hargreaves Hill, Yarra Glen . Such nice fresh produce available in markets. Imaginative salads and delicious healthy food available almost everywhere. Feeling like a resident in different iconic places – hopping on and off ferries in Sydney, and having the privilege of staying in ‘proper’ Australian homes. Fabulous! Packing for a beach-side wedding, cold nights in a Queensland winter, and the decidedly cool, damp weather in Victoria in August. Next time, we won’t be going for a wedding, and will aim for the Australian Spring or Autumn, when temperatures are reliable ‘nice’. No jumpers or coats needed! The cost of flying. Of course, it’s very expensive to fly around the world – so it should be. The domestic flights were expensive too, so next time we’ll be checking out the cheapest time to fly, and not flying once we are there. Our budget only stretches so far, even when we don’t need to book hotels around the place. Of course, for those without family in Oz there is always the option of a house swap. And you can get great deals on camper vans if you can be flexible. Relocating a van between Brisbane and Sydney, say, for $5AUS a day. Can’t be bad. It just needs flexibility and some thought. The journey. The first time I flew to and back from Australia we flew mostly at night, and broke the journey with a 24 hour stop over in Singapore. This time, the stop in Thailand made the journey quite easy, but the return trip was horrible. We flew Malaysia Airlines and had booked out of Brisbane. They cancelled flights from Brisbane the day before we flew – so we had to fly to Sydney first. Of course, this didn’t cost us extra, but it added 6 hours to the journey. We then had a 5 hour stop-over in Kuala Lumpur – not my favourite airport – and the flight out from there to Heathrow was delayed. Of course, it was busy coming into Heathrow, so we had to circle London. When we landed Heathrow was very busy and it took ages to get our bags and get out. So – almost 36 hours in transit, and very little sleep. Not great, by any means! In some ways ten weeks was perfect, as we really got into the life there. In some ways it was too long, and ‘real’ life was on hold for a large part of the year. I’ve also found that since we got back our calendar is getting complicated, and there are some people it looks as though we won’t see at all this year. Even though it was winter in Australia, around Brisbane the weather was lovely during the day: just cold at night. Could be a great time of the year to visit further North in Queensland. 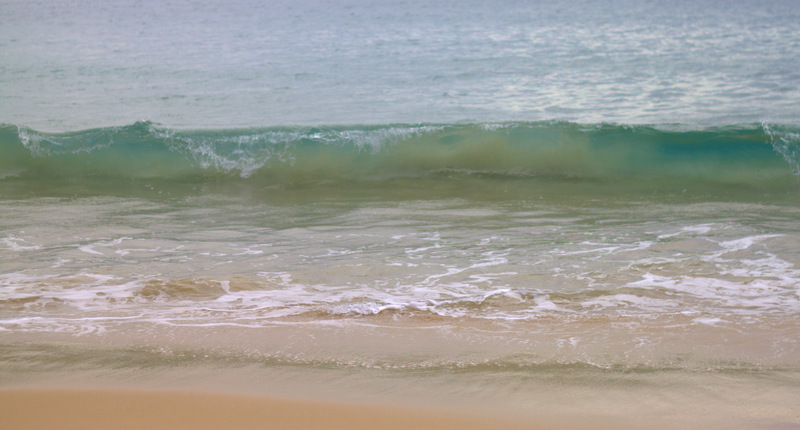 As you can see from my photo, the water at Noosa was very inviting! So the planning for the next trip starts here! Will we go round the world and meet friends and family in Florida and/or New Zealand? How long for? House swap? House sitters? One thing is for sure, the more we think about the options, the more likely we are to arrange something that works! What a morning! What a walk! 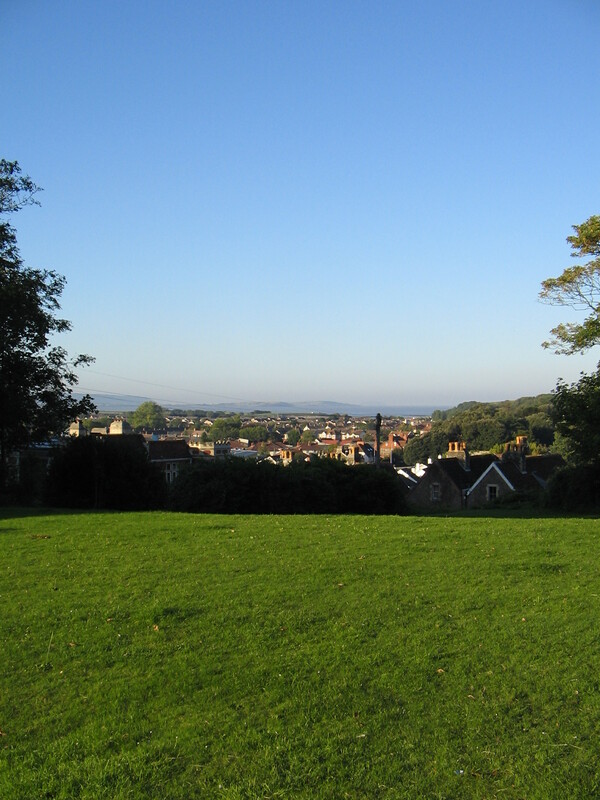 A perfect late September morning in England is a thing of absolute beauty, and that’s what we had today in Clevedon. I went for a walk before breakfast, and went further than I expected to, as it was too difficult to stop! 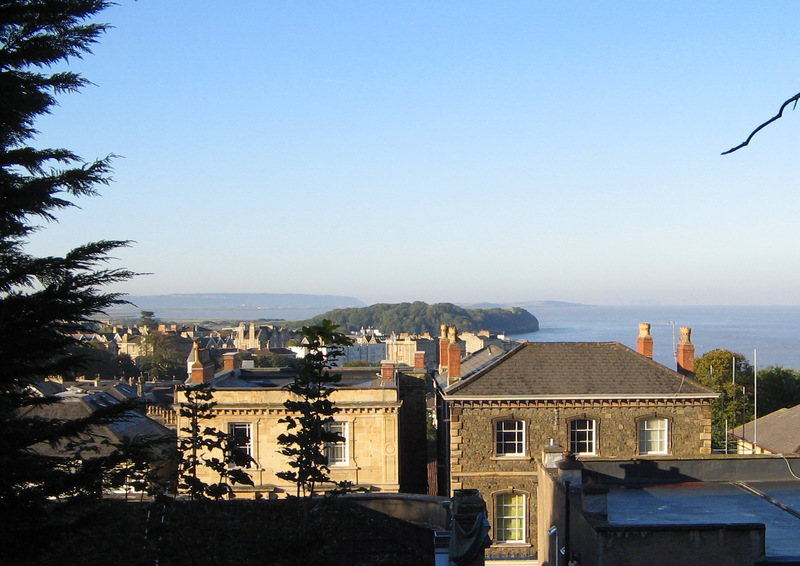 First photo shows the view across the little park in Jesmond Road… Most views of the coast show the headlands further down the North Somerset coast, and you can often see the islands of Flat Holm and Steep Holm, as well as the distant North Devon coast. And of course Wales across the Bristol channel. The view is the reward for a fairly steep climb up the hill! 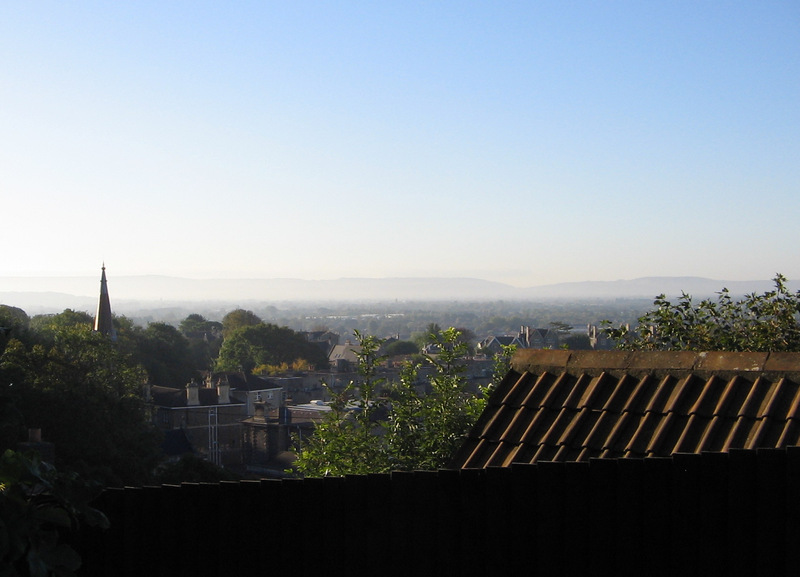 … and looking across the town towards the distant hills. At least some of the hills shown are the Mendips. 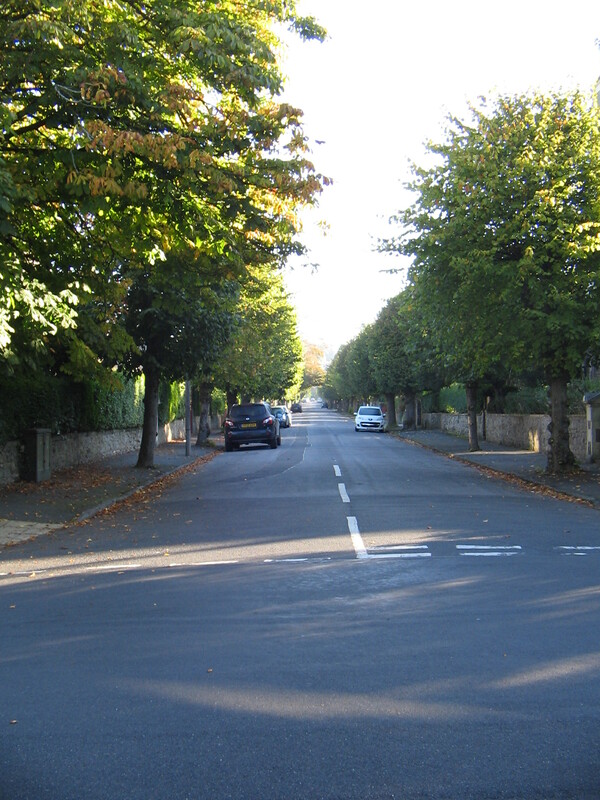 Then I walked down Kings Road and Cambridge Road, past The Avenue…. 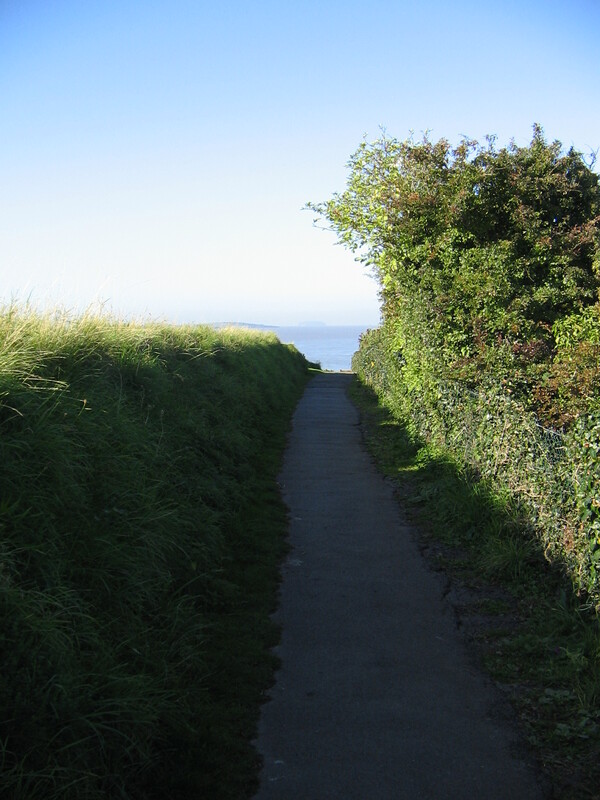 I was planning to walk home from the sea front, but the day was so pretty I finished off by walking around Poet’s Walk. No ravens or peregrine falcons today, but plenty of other birds, including a heron looking hopefully at the puddles in the Marine Lake. I’ve tried to work out the distance and I think it’s about 3.5 miles. The route includes some fairly steep hills, so it was quite good exercise. But more importantly it was a total pleasure – just as good exercise should be! 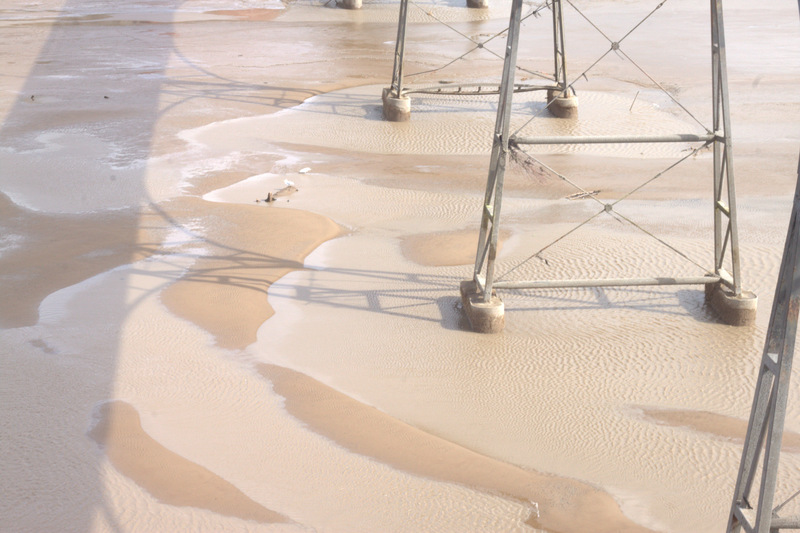 Now, that’s what I call a low tide! 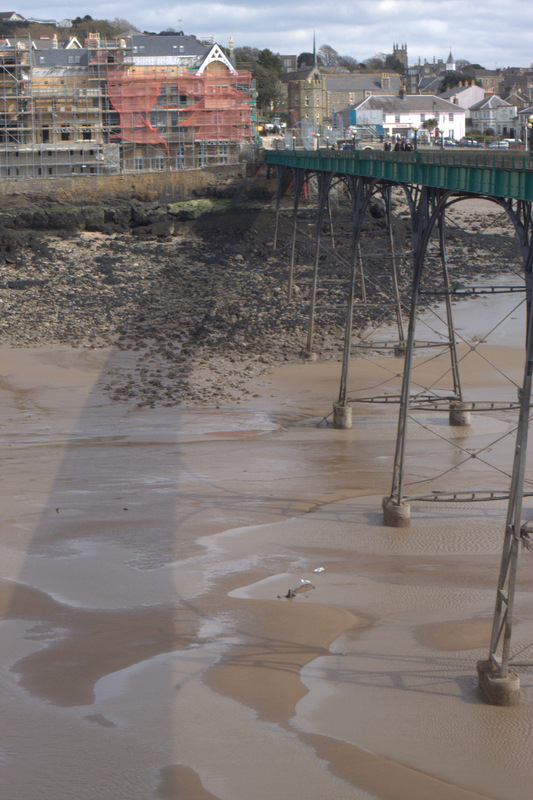 Great walk along the sea front today and the tide was as low – no, correction – lower than I have seen it in the three years that we have lived in Clevedon. Things have gone a little quicker on Hill Road, where the new mini-Sainsbury store has just opened. I’m not a great fan of supermarket chains, but it does add to the range of products you can buy on Hill Road. The One Stop store round the corner has just been refurbished too – presumably because of the competition of a new store. I hadn’t realised that One Stop is a subsidiary of Tesco, although the branding in the store is now much more like Tesco’s branding. Very interesting – I had assumed it was an independent store. 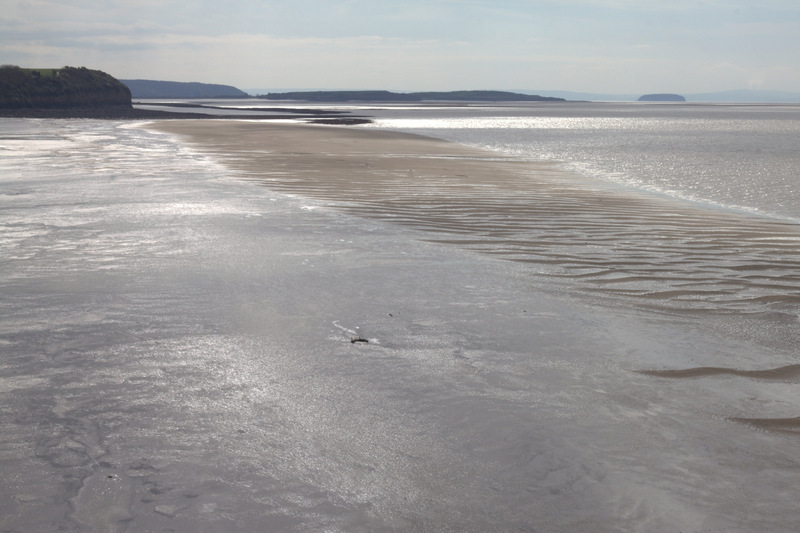 Back to the estuary… Lovely to see the marine geography so clearly exposed further down the coast. A similar low tide yesterday caused some local excitement when some geocachers went out onto the mud and got stuck to some degree. I think it was more panic from observers than a real risk, but the emergency services were called in to rescue them: we heard sirens steadily throughout the afternoon and wondered what was occurring. Today’s walk was to show our current Airbnb guest, a student with the Bristol Groundschool, the local sights. It is so nice to meet people of different nationalities, and to hear their stories and how they have become pilots. So far we have hosted students from the UK, Italy, France, Denmark, Hungary, Norway and Poland, and we’ve only been in business for a few months. It’s so nice to hear from the European students that their experience of the UK is far superior to their expectations: the legend of football hooligans, hen and stag parties and nightclubbing holidays in the sun has sadly led to low opinions of the British (or to be fair, the English) abroad. I do realise that this post is slightly random, but then so is life! Safe cycling, safe walking, safe motoring. What’s the answer? Shared use of roads by cyclists and motorists and of paths by pedestrians, cyclists and (sometimes) motorists is an issue that won’t go away in the UK these days. I’ve just read an online news snippet about BBC presenter Jeremy Vine being stopped by the police for cycling at 16mph on a path. His quote is “If cyclists are forced to travel at walking pace, they will return to the roads and mix it with trucks.” Local papers here in North Somerset have had a series of quite emotional letters from outraged pedestrians, who feel they are being pushed off the paths by cyclists; outraged cyclists, who feel that their lives are at risk if they are forced to cycle on roads and would like to be able to cycle on paths without being criticised; and outraged motorists, who cannot bear the fact that they sometimes have to slow down when there is a cyclist on the road. The problem is that roads in the UK are often quite ancient, having developed from lanes where occasional horsedrawn vehicles made their slow and steady way between farms and settlements. 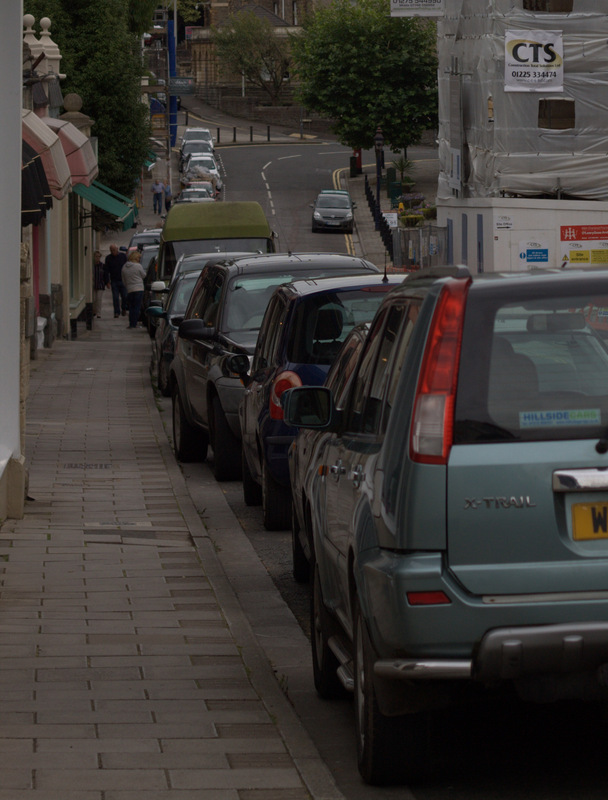 Other than in new town developments where there is space to provide separate lanes for motor vehicles and for cycles, our roads are often narrow to begin with and then further narrowed by being lined with parked cars. All forms of transport are pushed into close and dangerous proximity. We are all at risk. Far too many cyclists are killed on the roads – even one death is too many – but there are risks for pedestrians when people cycle on the path, much as cyclists would like to believe it is a risk-free activity. I know this to be true because as a small child I stepped out of my garden gate while waiting for my parents to go shopping and was knocked flat by a cyclist who was moving fast and couldn’t stop in time. I ended up in hospital having a head injury stitched, and the cyclist ended up in shock/trauma/guilt. The best solution is sadly unachieveable in the short term: to have dedicated cycle tracks everywhere there are cyclists. Much credit needs to go to the many organisations working to get safe cycle routes established, but there are planning issues in establishing route and usually funding issues too, so they cannot be quickly built. In any case, they usually run between towns, so they rarely address the problem of how we can all safely share roads and paths in our towns. I believe the short term solution arises from increased awareness, consideration for others and training. Cyclists need to develop and use the same observation and anticipation skills as advanced mtorists – look to see what is happening around you and what think about what might reasonably be expected to happen next. If you are cycling down a residential path, anyone could step through a gate at any moment. If there are tall fences and hedges either side of a gate, you may not see someone until it is too late. If there is an adult with a pushchair ahead of you, they might have a toddler you haven’t seen, who might run in front of you. A person walking in the same direction as you may have sight or hearing problems, and may not be aware of you, even if you ring a bell at them. If the route runs beside a beauty spot, people might stop suddenly or step to the side to look at the view, or to take a photograph. If you are approaching a corner, anything could be out of sight on the other side. Pedestrians are unpredictable – they veer across paths to head for a shop, pub, toilet, a chat with an old friend or to take a seat, so when pedstrians are about, you have have to expect the unexpected. If it is dangerous for a cyclist to use the road and they switch to a path, they need to be aware of all the potential risks. While they are unlikely to kill someone if they hit them at 16 mph (unless the person has a weak heart and dies of the shock, or has brittle bones so sustains life threatening injuries in the fall, or falls badly and suffers a fatal head injury) the pedestrian can suffer nasty injuries. They can also get a fright from having a cyclist whizz past them at speed, and for the elderly or infirm this can make getting out for a walk a trial when it should be a pleasure and a health-giving activity. To return to Jeremy Vine’s point ( “If cyclists are forced to travel at walking pace, they will return to the roads and mix it with trucks.”) I think that most reasonable people, including most police officers, wouldn’t expect to enforce a 5 mph limit if the cyclist is on an empty path with excellent all-round visiblity and there are plainly no pedestrians anywhere near. However if there are, or might be, pedestrians around they must be given priority on the path, and cyclists must make sure they can move out of the way or stop quickly if needed. Logically, that means going slowly, and a 5 mph speed limit sounds about right. Road Safety training is generally available. If you aren’t confident about cycling safely, or feel that as a driver you need more training on how to safely interact with cyclists on the road, make enquiries locally to see what is available for you. You can also get plenty of hints and tips from revisiting the Highway Code. I walk everyday, drive occasionally and would love to cycle more. I really hope we can all work together to make sure we can use our roads and paths safely and enjoy getting out and about. but I haven’t talked about how well situated the town is for a visit en route from almost anywhere to the West Country or Wales, and now I really should, because we have just listed our house on Airbnb and we are hoping for bookings! Why have we listed? Well, we have a beautiful house, with rooms that we don’t use unless we have guests, and so which are usually empty. 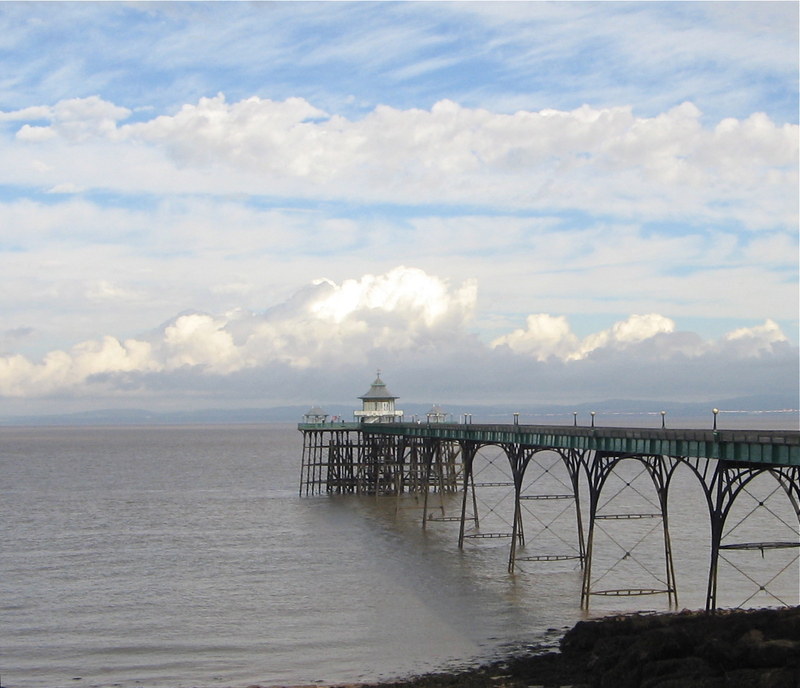 Some lettings income will help to supplement our other earnings (freelance writing, art sales, pension) and offering some Bed and Breakfast facilities may also help visitors to Clevedon, as there are not that many places to stay in the town. 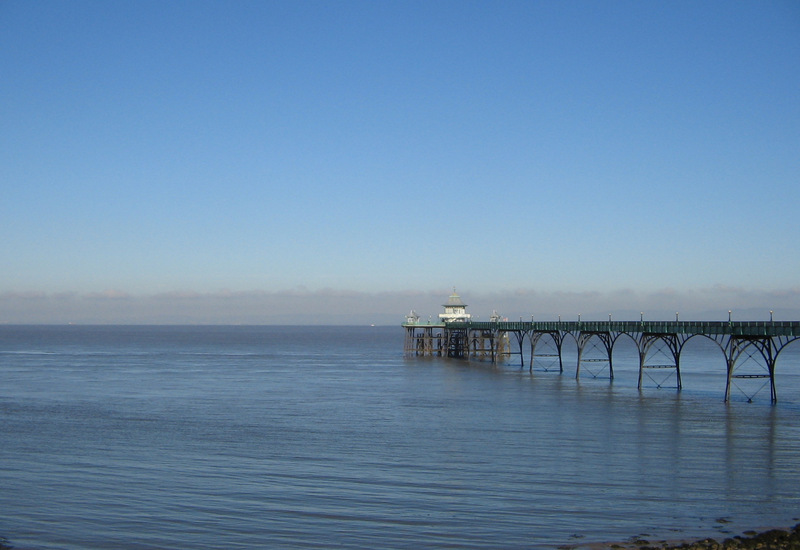 Clevedon is well worth a visit in its own right, partly because the seafront is so unchanged from Victorian times, and partly because geography makes the place – the sunsets and the views across and down the Bristol Channel – just so picturesque. It’s also really handy for a day trip to Bristol, being just 15 minutes by car or 30 minutes by bus to Bristol city centre, and the glories of harbourside and the SS Great Britain, Clifton suspension bridge, the old city with the markets and lanes, and roughly a trillion great places to eat and drink. If you fancy a road trip of Somerset, include Clevedon in a series of bed and breakfast stops, and take in the Cheddar Gorge, the Mendips, Glastonbury, Wells, Bath, Bradford on Avon, the Somerset Levels, Brean Down and many more places and attractions besides. We are also perfectly placed if you are travelling to Cornwall from London or the midlands. It’s a long drive to Penzance, but from Clevedon it’s only about 2 and a half hours, so you arrive fresh and happy rather than tense and wrung out. The same thing applies for those travelling across to Tenby and the lovely Pembrokeshire coast in Wales. There! Regional and personal promotion over. Maybe we’ll get to meet in person one day? 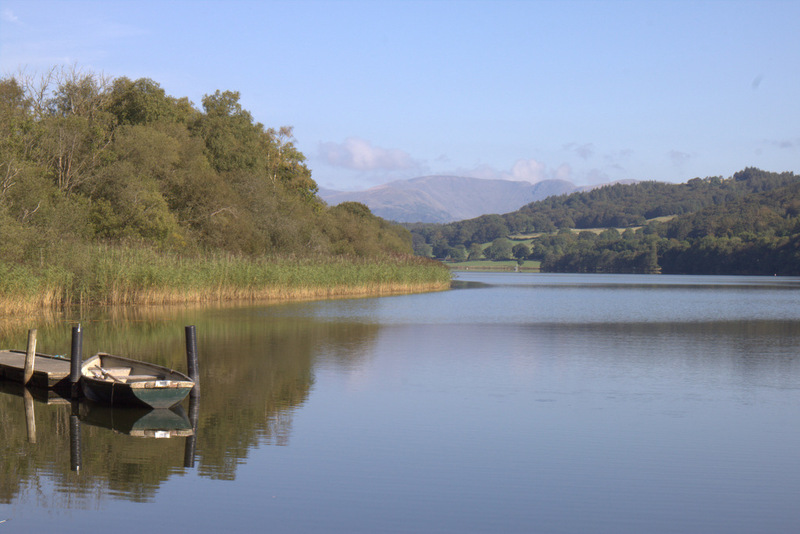 What a fabulous few days up in the lakes with lovely company and beautiful weather. There were so many photo opportunities, as the low, golden September light and still conditions made all the textures stand out and the colours sumptuous. I’m now sorting masses of material, and will be offering my favourite shots for sale through alecarte.com. The good weather meant there were still plenty of tourists about, but the crowds of high summer have passed, so it was relatively easy to find parking places and secluded spots. And of course there are lots of opportunities to get right off the beaten track. 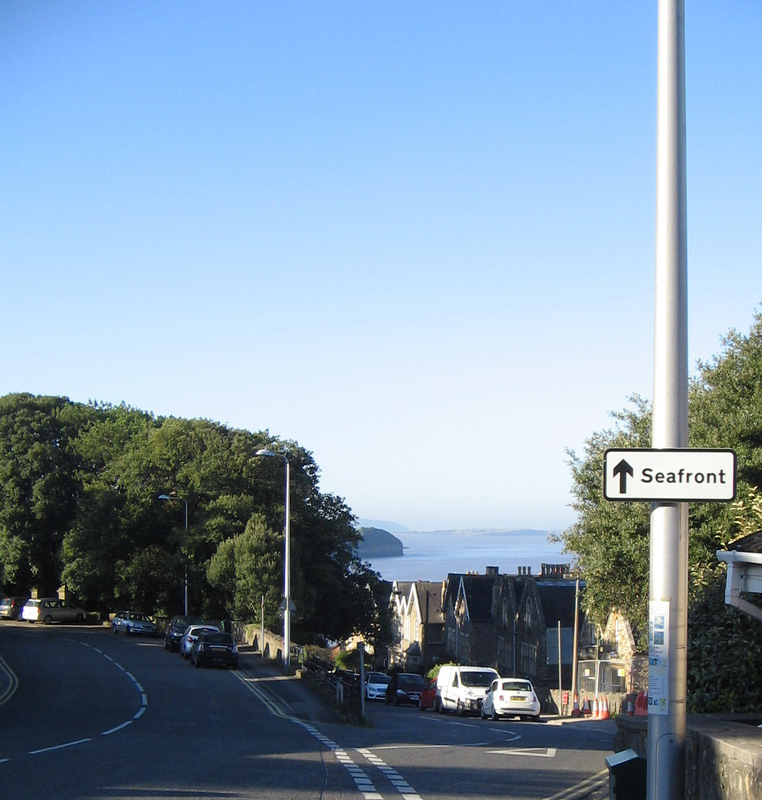 A particular high spot for me was seeing red squirrels in the wild around the charming little town of Cockermouth. I have seen them before, but only in wildlife parks. Recent efforts to support these natural British mammals seem to be working, and local people are making sure they have a habitat and can thrive. So lovely to see them running around, feeding up and preparing for the hard winter months! I didn’t even try for a photograph: I didn’t have the right kit with me, and I didn’t want to waste a moment of just enjoying the sight. We were too late to see osprey as they head for Africa once summer is over, and you have to try a bit harder for otters, I think, but maybe next time! We stayed at Rose Cottage guest house, and it was scrupulously clean, very comfortable and the breakfasts were excellent value. We will go again. There were firsts for visiting some historical places too, and I really enjoyed Beatrix Potter’s house, Hill Top, and William Wordsworth’s childhood home on Main Street in Cockermouth. Hill Top was very busy – well, it’s a small house on a small plot and Miss Potter is eternally popular – so parking is limited, but it was well worth the visit. The atmosphere is exceptionally homely and warm, and the house looks just as it did when she lived there. We were able to park in the hotel car park next door – their tea room is busy with visitors to the village, and the view from their terrace is wonderful. I don’t need to tell you how varied and exhilarating the opportunities for walking and cycling are. Miles and miles of stunning walks, and plenty of people taking full advantage! Some of the roads need a confident driver and a suitable vehicle – Wrynose and Hardknott passes anyone? Steep (very), bendy (very) and narrow – single track with plenty of cars with nervous drivers comng in the opposite direction. A white-knuckle ride indeed, and I think we’ll consider hiring a 4×4 next time. And there will definitely be a next time!! Lovely day out yesterday, even though it rained, at Tyntesfield House, near Wraxall, just south of Bristol. You’ll find it – just check a map! Very well worth a visit if you like classic houses and country walks. 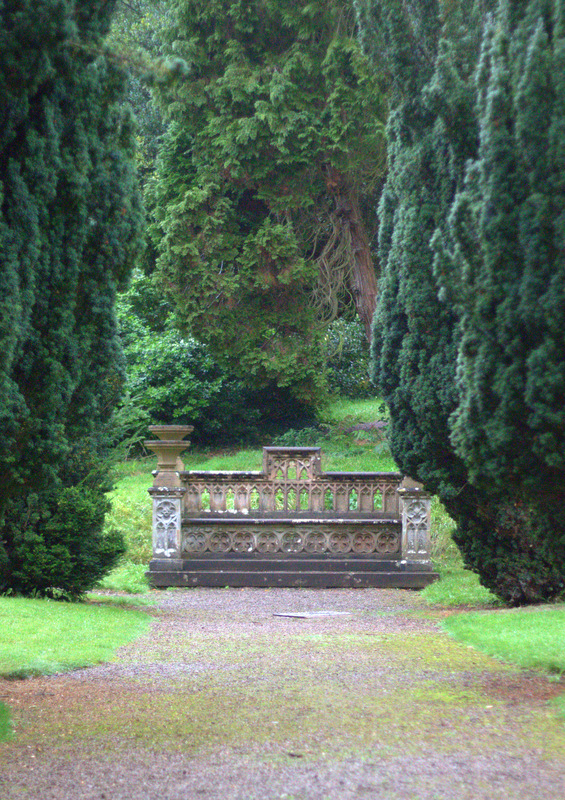 The picture shows the stone bench at one end of the long avenue of trees. The house itself is a glorious Victorian gothic creation, on the side of valley with fabulour views. The National Trust have been restoring it since 2002, gradually bringing back rooms into use. The grounds are extensive, with long and short walks to choose from. As always, there’s a cafe, charmingly situation in an old cow barn and there are lots of things to discover in hidden away spots. I bought a couple of second hand books at bargain rates, and they had a very healthy selection of plants and herbs on sale. Usually you spot some wildlife too, and often there are buzzards circling around, but the weather yesterday was a bit damp for them. The whole site is quite hilly, so if you want to explore properly you need to leave your heels in the car and switch to trainers instead!